Multi-Factor authentication (MFA) is an online security system for your sensitive and personal information. It requires more than just a password for access. The goal is to create a layered defense for your data so that an unauthorized person finds it more difficult to access. If your password becomes compromised, there will be another level of security to keep your information safe. BSC uses Duo Security MFA to provide you with even better security for your sensitive information. How do I enroll in Duo Multi-Factor Authentication (MFA)? Visit https://2fa.ndus.edu and click Start setup to begin enrolling your device. Use your NDUS account ID and password to log on at the NDUS Duo Device Management screen. Select the type of device you would like to enroll and click Continue. We recommend using a smart phone for the best experience, but you can also enroll a land-line telephone, or an iOS/Android tablet. Select your country from the drop-down menu and enter your phone number. Use the number of your smartphone, landline, or cell phone that you have with you when logging in to a Duo-protected service. You can enter an extension if you chose "Landline" in the previous step. Double-check that you entered it correctly, check the box, and click Continue. If you are enrolling a tablet you will not be prompted to enter a phone number. Choose your device's operating system and click Continue. How do I add a new device to Duo Multi-Factor Authentication (MFA)? To start enrolling a new device, log into https://2fa.ndus.edu and click "Add a new device". Note: some of the options shown below can vary depending on the device you are using. Choose an authentication method and complete multi-factor authentication to begin adding a new device. If you are adding a new device to replace one that you previously activated for Duo Push, don't select the Duo Push authentication method on this page unless you still have the original device. If you don't have the original device, but you have a new device with the same phone number, then you can authenticate with a phone call or SMS passcode. You cannot add a new device from this page if you do not have access to any of your previously enrolled authentication devices; Please contact the BSC Help Desk for assistance. Proceed with the device enrollment process as shown in the initial Enrollment Guide. As an example, let's add another phone. Enter and confirm the second phone number. Select the new phone's operating system. Install Duo Mobile on the new phone and scan the barcode to activate. The new phone is added and listed with your other enrolled devices. 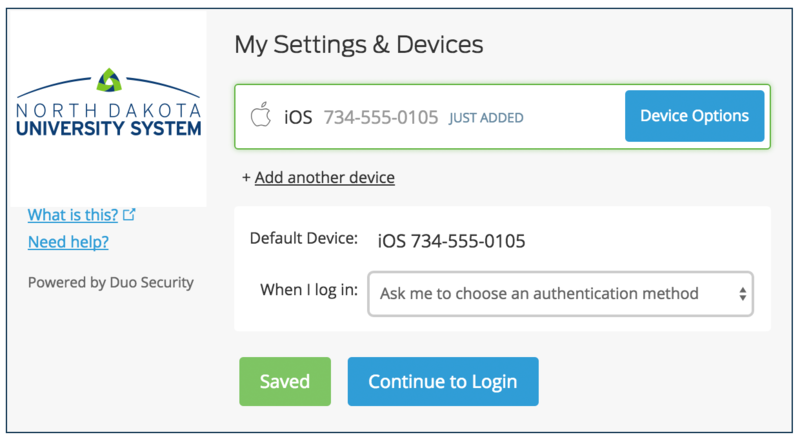 You can click Add another device to start the enrollment process again and add another authenticator. How do I install Duo Mobile? Follow the platform-specific instructions on the screen to install Duo Mobile. After installing our app return to the enrollment window at https://2fa.ndus.edu and click I have Duo Mobile installed. Can't scan the barcode? click Or, have an activation link emailed to you instead and follow the instructions. You can use Device Options to give your phone a more descriptive name, or you can click Add another device to start the enrollment process again and add a second phone or another authenticator. Your device is ready to approve Duo authentication requests. Click Send me a Push to give it a try. All you need to do is tap Approve on the Duo login request received at your phone. From Duo Mobile, download and store passcodes in a safe place such as a backpack, wallet, or purse. In the case of a drained or misplaced phone, you can use one of the codes to get access. Codes can only be used once, so we recommend downloading multiple codes at a time. You can enroll multiple devices on your Duo account. We recommend that you add at least one secondary device such as the phone number of a trusted friend and/or family member. The next time you're prompted by Duo, select "Send Me a Push." You will receive a notification on your device with the Duo app installed. All you need to do is to tap on that notification, approve it and you’re in. The Duo app must be installed for Push to work. On systems that require you to log in for every instance, you can have Duo remember you for up 10 hours. To activate this, click the check box in front of "Remember me for 10 hours" next time you're prompted by Duo. What happens if I get a Duo prompt and I’m not trying to log in? If you receive a Duo authentication prompt (push, text, or phone call) on your device without you initiating the request, decline the Duo prompt (marking it as fraud), immediately change your NDUS account password, and contact the BSC Help Desk. This could be an indication that your credentials have been compromised and someone is attempting to login to your account.